Another nice day in San Francisco; I have been in booth duty most of the day and I have finished the day with a first presentation, with George Trujillo about J2EE Deployment strategy. This presentation I hope was interested for the quite big audience, the long Q&A session -1h, it is nice to be the last in the room- was very good since I talk with various Oracle customer about J2EE management in perspective of the database management. The benefits of Oracle Grid Control for Database and AppServer administrators… I would invite you if you are not familiar with Oracle Grid Control to take a look to OTN. Some of the interesting point is the announcement of the new OracleAS 10g R3, that enhanced the Fusion Middleware to deliver SOA, beside the support of J2EE 1.5, Java 5, EJB 30, JSF, I was very pleased to spend my day demonstrating our new UDDI V3 registry that continue to expend our Web Services stack by giving new services in addition to BPEL and Web Services Manager. The first Oracle World Day for me has started with finishing the various demonstrations of the J2EE Core OC4J and Web Services demonstration Pods. Tomorrow Monday, we will be showing some very cool stuff around Web Services development and management, with some good news around Web Services Registry. Also on the J2EE Core, nice demonstrations of the different services but some of the new features of the OracleAS 10.1.3 such as the new clustering framework and the usage of scripting technologies, especially Groovy, to administer and monitor OracleAS, thanks to JMX! What about the rest of the day, I was invited to the Web Services Special Interest Group, WS-SIG, - no.. this is not a new acronym in the WS-* world-. This new SIG has been created in the beginning of the year and on the behalf of IOUG, please take a look to the WSSIG web site. . One of the very interesting things of this SIG is, like the J2EE SIG (Organized by OTUG, IOUG, OAUG and Oracle), developers, architects, and administrators of Fusion Middleware, the Database and Oracle Fusion applications are talking together. This reunion of people is good since we all from development to operations have a different view of systems. So during this panel we have introduced quickly the concepts, and then the audience jumped in for the Q&A session, as you can guess, we add the classical questions around Web Services for the enterprise such as what about security? Management? Life Cycle ?… and so on. We answered obviously, but I would say if you are lucky enough to be at San Francisco this week, please come to the Demo Ground especially Web Services, Web Services Manager and BPEL where you will see the Oracle products in action and you will be able to find experts to help you to answer your questions. 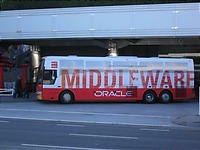 What about Oracle Blog dinner? OC4J 10g (10.1.3) is a J2EE 1.4 containers, so as part of the specifications, it supports JMX for management and deployment. One of the benefits of JMX is the fact that finally Java applications, and in our case the J2EE containers, have a standard based interface to be administered. OC4J exposes using its MBean Server system and application lever management beans (MBeans) that you can monitor and control from the Oracle Application Server Control (ASC) that is pre-deployed; but you can use any JMX client application. 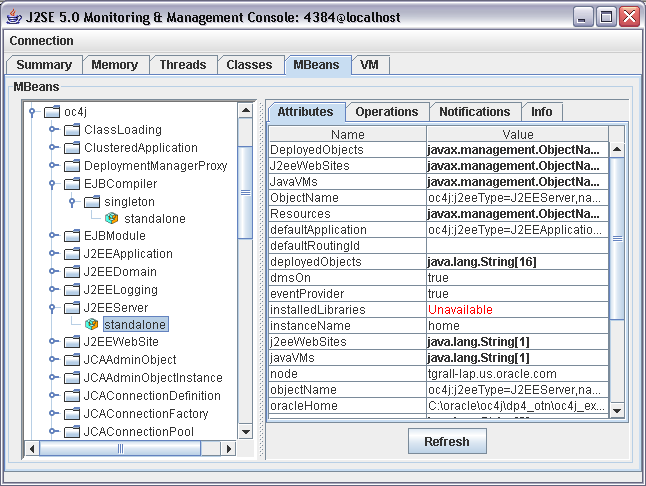 Sun has included as part of Java 5 JMX but also provides a standard JMX client called JConsole. This post is simply explaining how you can use the Sun’s JConsole with OC4J. 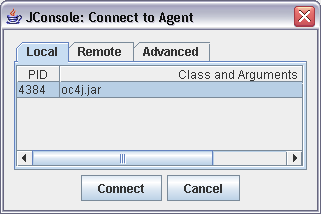 The -Dcom.sun.management.jmxremote system property creates an RMI connector to the MBeanServer, we will use this RMI connector from the console iself. Start the JConsole, with the following command, adding the OC4J administration class to the classpath. Zend Core for Oracle, developed in partnership with Zend Technologies, supports businesses using PHP with Oracle Database for mission-critical Web applications. It provides a seamless out-of-the-box experience delivering a stable, high performance, easy-to-install and supported PHP development and production environment fully integrated with the Oracle Database. Zend Core for Oracle will be available as a free download from Zend in late 2005; it is currently available in Beta. Support and updates for Zend Core for Oracle will be made available directly from Zend. Find more and download link from OTN. I have been playing around with Google Talk It is quite nice, once again I like the look… But I do not see ‘revolutionnary’ features… Like Skype I was able to use it at work IM and Voice chat… I like the fact that they document how to work around their lack of platform support… I would like to have a mac version… I am surprised that Mac users in Google did not yet implement it! Fo developer perspective it is interesting to know that they use standard based protocol such as Jabber/XMPP, and they invite people to use the API (since open standard) and server… Take a look to the developer section of their documentation. This last 2 weeks have been kind of crazy for me, and for Oracle.. Last week we were present at the Oracle Developer Tools User Group, and immediately jump in for the 10th edition of JavaOne. I was not able to attend as much sessions as I wanted, but I had the pleasure to work a lot on the Oracle Booth in the JavaOne Pavillion. I worked on the J2EE, JSF, BPEL and Web Services ones. It was really great, with lot of technical questions around our products; I have to say that this year we had lot of interest around JavaServer Faces and EJB. Oracle is participating to MyFaces project. You can find more information on JavaServer Faces on OTN. Oracle will lead the development of the JSF extension for Eclipse, as you may know Oracle JDeveloper, now free, has one of the most appealing JSF Designer tool. So we are currently porting this design tools inside Eclipse, to facilitate the adoption of Faces by the developers. Mike Keith, Toplink Architect, will be now co-specification leader of the persistence specification. Also Oracle will develop the Reference Implementation of the persistence engine of the JEE 5 platform. As you may know you can already start to develop EJB 3.0 within the early implementation available on OTN. Note that the next release of Oracle Application Server 10g (10.1.3), EJB 3.0 will be supported. As you may have seen some weeks ago, Oracle is also the lead in the Eclipse project to implement the EJB 3 tool. Also still around Eclipse, Oracle, most successful player around BPEL, will continue the development of the BPEL deigner inside Eclipse and put that officially in the Eclipse Project. If you are not familiar with BPEL, I will invite you to jump to the OTN Web Site. JavaOne Day 1: What Do to Today? Also I think the opening Sun’s Keynote from 8:30 to 11:00 am will be I am sure a good starting point for this week !